The brief was to provide a new sports enclosure to include an area of covered seating and spectator spaces, the provision of new toilet and changing facilities and storage for sports equipment large enough to accommodate the changing needs and increasing services that the University of Southampton provide at their sports facilities on Wide Lane in Eastleigh. The site already had a pair of disused portacabins and a redundant boiler house which as part of the works were stripped out, fully refurbished and clad in larch timber to provide adaptable storage spaces. 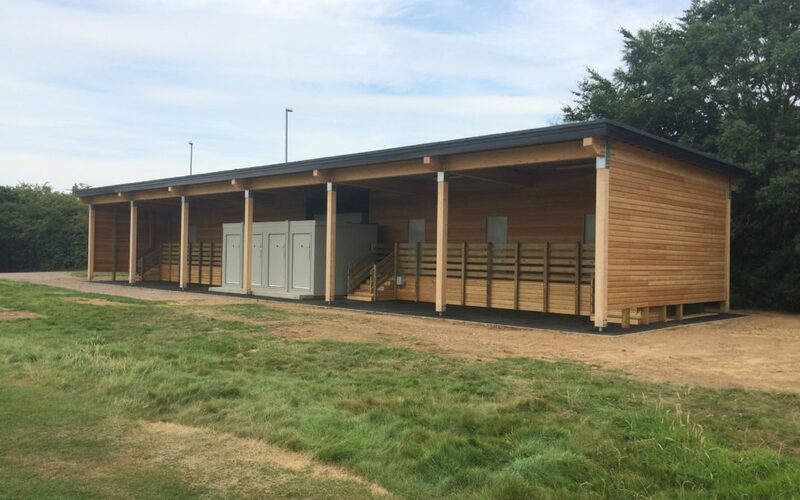 A new purpose built portacabin containing fit for purpose toilet and changing facilities was craned into the site with a new pitched glulam roof constructed above to tie all of the elements together and provide a covered enclose protecting spectators from the elements whilst watching sports on the adjacent playing fields.